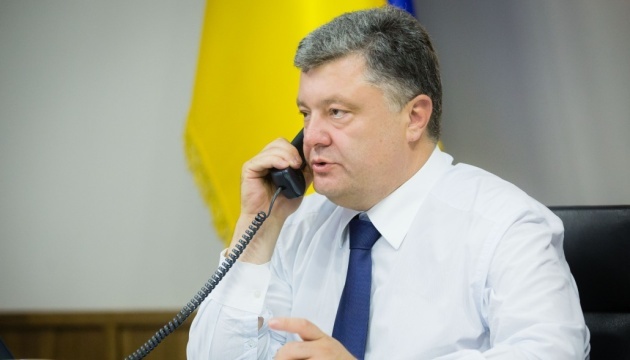 President of Ukraine Petro Poroshenko had a phone conversation with President of France Francois Hollande and Federal Chancellor of Germany Angela Merkel. The Head of State expressed deep concern over the recent provocation by Russia in the temporarily occupied Ukrainian Autonomous Republic of Crimea, which caused abrupt aggravation of the security situation. According to Petro Poroshenko, Kremlin’s accusing Ukraine of alleged subversive activities on the peninsula is aimed, inter alia, at discrediting Ukraine in the eyes of the international partners. The fact that the Russian side had used the abovementioned provocation as a pretext for torpedoing the Normandy format activity and the implementation of the Minsk agreements raises particular concern. In their turn, Angela Merkel and Francois Hollande emphasized: non-recognition of temporary occupation of Crimea is their unwavering position, which cannot be put into question. Leaders of Germany and France promised to comprehensively facilitate de-escalation and expressed willingness to work together to settle the situation.